The April issue consists of a beautiful overland mapping style. 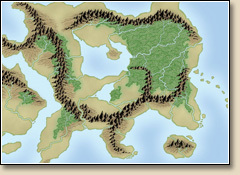 The bitmap artwork was created by Swedish cartographer Pär Lindström and has been faithfully translated into CC3 to let you draw your own maps in his style. The style lends itself extremely well to large-scale overland maps, i.e. whole continents and worlds. 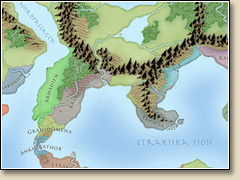 The accompanying mapping guide takes you through the process of creating such maps.